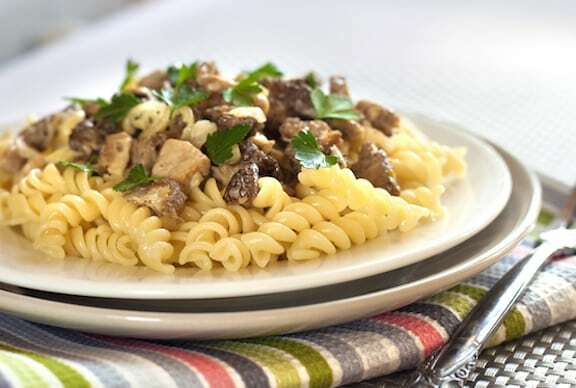 Mushroom lovers will revel in this earthy yet elegant vegan presentation of stroganoff, featuring a multitude of mushrooms in a creamy sauce, served over pasta. 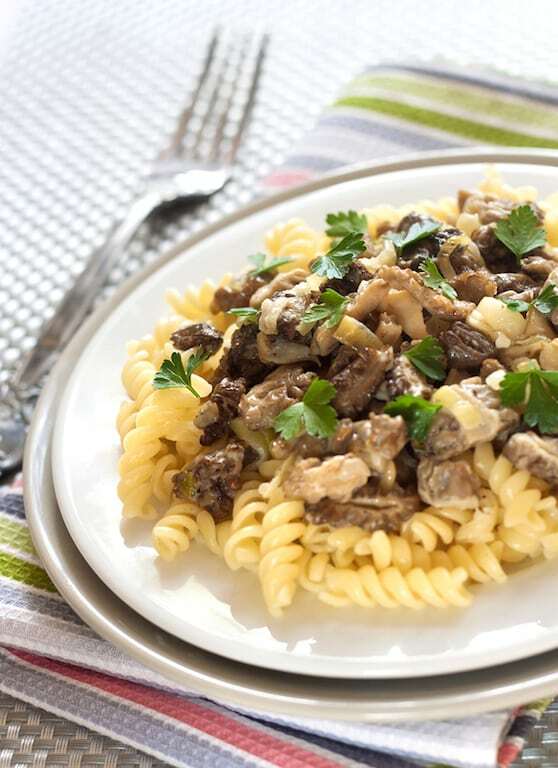 Consider looking for morels, which contribute a particularly “meaty” texture to the dish. Not that we want to imitate meat, but morels are delicious in their own right. Heat the oil in a large skillet or stir-fry pan. Add the onion and sauté over medium heat until golden. Clean the mushrooms and prepare as directed. Add to the skillet or stir-fry pan with the wine. Cover and simmer over low heat for 10 to 15 minutes, or until the mushrooms are tender, then remove from the heat. Stir in the sour cream, season to taste with salt and pepper and cover. Meanwhile, cook the noodles in plenty of rapidly simmering water until just tender, then drain, reserving 1/4 cup of the cooking liquid. Transfer the noodles to a serving container. Stir in the Earth Balance and just enough of the reserved cooking liquid to moisten. Season to taste with a bit of salt, if you’d like. To serve, place a bed of pasta on each plate, then some of the mushroom mixture. Garnish each serving with a little parsley. This is amazing! I used no salt added vegetable broth because I didn’t have any wine, added a little crushed red pepper seed and horseradish during the cooking process to make it just mildly spicy, and served it on a bed of fresh spinach. I also added some Quorn crumbles to my husband’s portion (he’s convinced it was beef stroganoff! )I will be making this often – it’s a perfect meal for a “mixed” vegan/carnivore family! So glad you and your enjoyed this, Ann. I like the idea of serving it on a bed of spinach — I’ll have to make it this way again soon! You mention “Earth Balance”… are you referring to soy milk, spread… other? Noel, good question, as Earth Balance does make a lot more products these days. I’m referring to the buttery spread, and updated the recipe to reflect that Thanks! I made cashew cream/milk with my nutribullet, but how much is required, 1/2 cup, 1 cup? Barry, use as much as you’d like to moisten the pasta — some people like it saucy!